Born in Governor’s Harbour, Eleuthera, Casuarina was thrown into the ocean when she was just 5-days old, and “I’ve had a hard time getting out,” she joked at our studio. Casuarina practically grew up under the sea, swimming, diving and fishing. “I have probably spent more time underwater than on land,” she said. She has gained a deep respect for the marine environment, along with an understanding that it needs to be nurtured and a passion for protecting it. Protecting the environment and fisheries today means sustaining our resources and food supply for tomorrow and for future generations. Her background is in science, she graduated with honors from Duke University with a degree in Environmental Science & Policy, and Marine Biology. And she is adamant about passing her knowledge on. 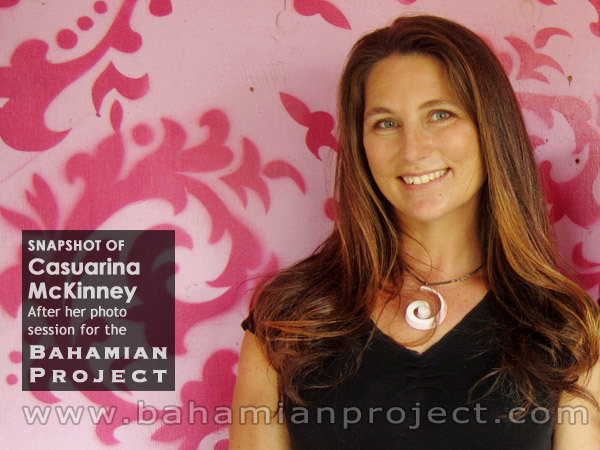 In 2002 Casuarina McKinney-Lambert became the first Executive Director of the Bahamas Reef Environment Educational Foundation (BREEF) a non-profit organization focused on educating Bahamians about their marine resources. Through BREEF Casuarina strives to influence environmental policy in The Bahamas to protect and sustain our marine environment so that we will not lose what we have. We met by chance on the road when her car had broken down a few years ago. I turned around to help her and we had such a lovely, memorable conversation. A year later when she was getting married she searched for me to make her wedding cake and it turned out that the two people she asked knew me. I am naturally drawn to the same types of people strong women with gentle hearts who live simply and embrace life and their families. I am happy to know Casuarina who along with others respect and help us to take care of our world by being such good examples.